Although they may look colorless, most diamonds actually have a small amount of color. The Gemological Institute of America (GIA) has created a color scale that extends from D (colorless) to Z (light yellow or brown). Color grades are determined by examining each diamond in a controlled environment. Each letter represents a level of discernable color. Diamonds have a fingerprint. Not in the human sense, but in the sense that they each have a unique pattern of imperfections called “inclusions.” Almost every diamond has inclusions (truly flawless diamonds are extremely rare); they are caused by the heat and pressure necessary to create diamonds and contribute to the stone’s character. A diamond’s clarity is a measure of its inclusions. The GIA Clarity Scale includes 11 clarity grades ranging from Flawless to I3. Before the first cut on a diamond is even made, the gemstone is carefully mapped to determine what kind of cut will maximize its brilliance. A cut and polished diamond’s radiance is based on its relationship with light: how light strikes the surface, how much enters the diamond, and how much – and in what form – light returns to your eye. A diamond cut with correct proportions maximizes its interaction with light. The result is spectacular fire and brilliance. 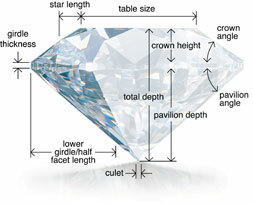 Contrary to what many people think, a diamond’s carat weight is a measure of the gemstone’s weight, not its size. One carat equals 200 milligrams in weight. Each carat is divided into 100 points. A 1-carat diamond = 100 points, a .75-carat diamond = 75 points, etc. Remember, diamonds with the same carat weight can vary greatly in value, depending on color, clarity, and cut. Choosing the perfect diamond is a matter of deciding what matters most to you then finding the best combination of factors to suit your needs.